← Question #11: Is it a sin to sing uninspired hymns in worship? 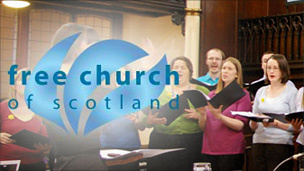 This entry was posted in News and tagged Free Church of Scotland, news. Bookmark the permalink. It is a sad thing to see, but it seems as though it has been coming for a while. When the head of the institution that trains a church’s pastors publicly opposes Biblically regulated worship, it does not bode well for the church. Perhaps we may learn something about the high standards which we must demand from our doctors of theology. To clarify the ecclesiastical situation in Scotland, I should point out that the Free Church of Scotland suffered a major breach of ranks in the year 2000, exactly one hundred years after its previous split. The quarrel was over a case of discipline following allegations of immoral behaviour that the majority sought to evade. It prompted the ejection of a substantial minority who ‘reconstituted’ the Church under proper discipline but took the name ‘Free Church of Scotland – Continuing’ for administrative purposes. Most of these ejected men were on the strict subscriptionist side of the Free Church so with their exodus the defecting majority gained asendancy in the denomination and after a mere decade and despite much acrimony they have managed to push through one of their pet schemes- ditching the old Presbyterian worship. Some of their ministers are on public record as regarding the pope as a Christian brother whose book on Jesus is one of the best ever penned; others are open to ordaining women to the diaconate if not the eldership. With a new, criminally lax attitude to ordination vows- which they seek to raise into a virtue rather than a grievous sin- one wonders what will slip next in the Free Church of Scotland. Not unnaturally some of the remaining conservatives in their ranks are highly disturbed by the blatant disregard of solemn vows and simmering tensions are surfacing . Question is- will they have the nerve and spiritual backbone to see their duty through, having compromised thus far as to allow this to fester to such a pass?